By good tradition, posts in the STC blog come with subtitles to let our readers have a (short) break to breathe deeply before diving into the next paragraph. The subtitles of this post come as—yes!—music titles, in a more oblique way referring to the content of the following paragraph and with the invitation to the readers to enjoy listening while having a break. Figure 1. Transcriptional regulation in eukaryotes. Source. In prokaryotes, it only takes a small jazz band to get the music grooving: piano and a rhythm section suffice. The promoter region of a gene is a tiny stage on which RNA polymerase (p) and few transcription factors (dr, b) improvise on a tune, i.e. they initiate or skip transcription. By contrast, it takes a big band in eukaryotes to perform Duke Ellington's 'Caravan'. And since not all the musicians fit to the narrow stage trombones and saxophones are placed elsewhere in the concert hall: transcription factors (tb, sax) bind to sites—enhancer or silencer elements—that are found upstream and downstream of genes and also within introns. In its typical textbook style, figure 1 oversimplifies the complex interplay of RNA polymerase II with the various transcription factors at a eukaryotic promoter by reducing it to a two-dimensional array, suspiciously omitting downstream located 'gene regulatory sequences'. This flatters our human ability to perceive 2D-maps at a glance but it ain't got that swing. Admittedly, only a 3D-animation could catch the groove of the spatial intricacies that bring enhancer-bound transcription factors into the proximity necessary for the multiple protein-protein interactions that orchestrate eukaryotic transcription initiation. Let alone the possibility that transcription factors bound to one enhancer interact with protein complexes at two or more promoters simultaneously. Please note in figure 1 the stippled grey line tagged 'spacer DNA', we will come to this later. Figure 2. DNA compaction stages in eukaryotic nuclei. Source. Transcription from a eukaryotic promoter is not straightforward and only possible when DNA is locally relieved from chromosome compaction—it is virtually completely compact during mitosis—as shown schematically in figure 2. Look at this figure by starting with the lower part. The FISH technique made mapping of genes in/on whole chromosomes (1,400 nm scale) possible already three decades ago. More recent approaches allow dissecting chromosome territories in interphase chromosomes when transcription is active (700 nm scale, scratching at the 300 nm scale) and mapping of large-distance and interchromosome interactions by the 4C technique (chromosome conformation capture (3C)-on-chip) with a resolution down to the 300 nm scale or even lower. Now look at figure 2 from the top part. 'Reading' DNA (2 nm scale) has become sort of trivial today and includes a detailed understanding of sequence-dependent variations in DNA curvature and helix stability. Mapping nucleosomes—DNA wrapped around histone cores—has left far behind the initially simple DNase technique. Covalent modifications at the N-termini of histones—acetylation, methylation, phosphorylation—trigger the 'tightness' of DNA-wrapping around nucleosomes and the density of nucleosomes on a given DNA stretch (11 – 30 nm scale). The degree of compaction is actively controlled as a means to regulate promoter activity as is further compaction by so-called 'scaffolding proteins' (30 – 300 nm scale). Modifications on one histone—or the lack thereof—greatly influence which modifications will decorate neighboring histone subunits in a nucleosome: there is crosstalk. Also, a number of enzymes modify both histones and non-histone substrates e.g. 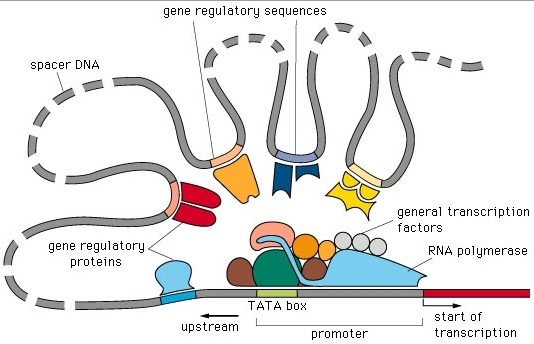 proteins involved in transcription and even ribosomal proteins that interact with rRNA. Because of the emergent complex syntax it seems appropriate to exchange the iconic term 'histone code' for the term 'histone language'. Last to mention here is the 30 – 300 nm scale where newly discovered long, non-coding RNA species, incRNAs, are involved in regulating the structure of chromatin together with a bunch of 'scaffolding proteins' as e.g. the SMC proteins. There was this stippled grey line tagged 'spacer DNA' in figure 1, a somewhat vague abbreviation. The DNA sequences of these 'spacer' DNA stretches are not important for the functionality of the promoter but their three-dimensional organization—including their histone-wrapping and higher-order structures—certainly is. They have to bring the enhancer elements in proximity to the promoter so that the enhancer-bound transcription factors can play their part of the tune. Axel Visel and his coworkers addressed this topic indirectly in a genetic approach asking to which extent distant-acting enhancers influence the looks of mice (craniofacial morphology) during embryogenesis. Figure 3. Identification of candidate craniofacial enhancers on mouse chromosome 5. The genome graph shows all p300-enriched regions (green dots). Known craniofacial loci were generally enriched in candidate sequences and were specifically targeted for sampling in transgenic assays (red dots). The genomic region studied by means of knockout analysis is highlighted by a blue box. Detail from Fig. 2; Attanasio et al. (2013). Attanasio et al. prepared face tissue from 11.5 days-old mouse embryos and mapped active enhancers by ChIP-Seq analysis with the p300 enhancer-associated protein as target. Briefly, this is the order: prepare tissue and cross-link the p300 bound to its specific DNA binding sites, followed by chromatin preparation, sonication and antibody enrichment of the protein-DNA complexes (immunoprecipitation). Finally, sequence the recovered DNA fragments to detect active enhancers by virtue of the p300 binding sites (see here for details of the technique). These authors detected genome-wide 4400 putative distant-acting enhancers active in the craniofacial tissue (figure 3). Figure 4. Regulatory landscapes of craniofacial loci. Enhancers near Msx1, a major craniofacial gene, were identified with p300 ChIP-Seq (green boxes). This included the re-identification of a region proximal to Msx1 with previously described enhancer activity (mm426), as well as four additional, more distal enhancers with complementary activity patterns. For each enhancer, only one representative embryo is shown; numbers in the right lower edge indicate reproducibility. Red arrows indicate selected correlations between Msx1 RNA expression (ISH) and individual enhancers. Red box indicates enhancer hs746, which was further studied by means of knockout analysis. Detail from Fig. 4A; Attanasio et al. (2013). Attanasio et al. chose 205 craniofacial candidate enhancers for further detailed analysis by LacZ transgenesis. Briefly: PCR-amplified candidate enhancer sequences cloned into a LacZ reporter plasmid were injected into fertilized mouse eggs and implanted into pseudo-pregnant foster females. F0 embryos were collected at days 11.5, 13.5 or 15.5. Reporter activity was determined by LacZ-whole-embryo staining and only patterns observed in at least three different embryos were considered reproducible positive enhancers. From the 205 candidate sequences, 139 showed significant p300 binding in different parts of craniofacial tissue, 49 were extremely conserved and 114 were highly conserved in human (see example in figure 4). Please note the distance of enhancer hs746 from the Msx1 gene. To obtain quantitative data, they analyzed several enhancers including hs746 further by optical projection tomography (OPT) (figure 5). Figure 5. Developmental activity patterns of enhancer hs746(Msx1). The in vivo activity of the enhancer was monitored at different stages of development (days 11.5, 13.5, and 15.5). The enhancer was reproducibly active in the craniofacial complex during embryonic development, with spatial changes in activity across stages. Side views are of LacZ-stained whole-mount embryos. Front views are optical projection tomography reconstructed 3D images. Regions of enhancer activity are shown in red. Detail from Fig. 5; Attanasio et al. (2013). Having mapped distant enhancers of craniofacial genes and shown their tissue-specific activity during embryogenesis, Attanasio et al. turned to genetics. They tested, as a final step, whether three particular enhancers located in the proximity of functionally unrelated genes—again including hs746, ~235 kb(!) away from Msx1—are important in modulating craniofacial morphology. To this end, they created three separate mouse lines carrying deletion alleles for each of the three enhancers using a standard homologous recombination strategy for embryonic stem cells. Mice homozygous for each of the three enhancer deletions did not display gross craniofacial malformations or other obvious deficiencies. They measured the effect of each enhancer deletion on the expression of the presumptive target genes Snai2, Msx1, and Isl1 by quantitative reverse transcription polymerase chain reaction (qRT-PCR) for different craniofacial structures of individual wild-type and enhancer deletion embryos at days 11.5 and e13.5. They found a 1.5-fold down-regulation of Msx1 mRNA in Δhs746 (see figure 6). In this and the other two cases, the changes in transcript levels of the respective target gene were confined to tissue subregions in which the enhancer was active. Subsequently, they compared mouse skulls from wild-type and enhancer deletion mice at 8 weeks of age. They employed micro-computed tomography (micro-CT) to obtain accurate 3D measurements of the skulls. Three cohorts, each consisting of at least 30 mice homozygous for a deletion of one of the three enhancers, were compared with a cohort of 44 wild-type litter-mates. Statistically significant, Δhs746 results in a shortening of the face, a widening of the posterior neurocranium, a narrowing of the palate, and shortening of the cranial base. The authors noted that although both Δhs1431 and Δhs746 have significant effects on facial morphology in structures derived from regions with enhancer activity at days 11.5 and 13.5, there were also measurable changes in other parts of the skull, underpinning that tissue development involves crosstalk with neighboring tissue. Figure 6. Expression phenotypes resulting from the craniofacial enhancer hs746 deletion. (left) In vivo activity pattern of hs746 (at day 13.5). OPT data are represented in red (LacZ, enhancer active) and green (no LacZ, enhancer inactive). (right) Expression levels of enhancer target gene Msx1 in craniofacial tissues dissected from wild-type (gray) and knockout (red) litter-mate embryos. Error bars show the variation among individuals of the same genotype; Mble, mandibular; Mx, maxillary; Nose, lateral nasal process. Detail from Fig. 6 B+D; Attanasio et al. (2013). Attanasio et al. demonstrate that deletion of craniofacial enhancers can result in non-pathological but measurable changes in craniofacial morphology in mice. The authors conclude that isolated examples of sequence variants in distant-acting enhancers associated with craniofacial malformations—such as clefts of the lip or palate—have already been described in humans. Circumstantial evidence points to noncoding sequences, including enhancers, as contributing substantially to these processes. Pathological malformations may represent the extreme ends of the normal spectrum of variation observed in their study. It bothered biologists a lot in the 1950s when it became clear that genome size in eukaryotes did not correlate with organism complexity, in clear contrast to what was found for bacteria, archaea, and their viruses. Older readers might remember here the 'C-value paradox': "… the fact that a complex higher eukaryote such as Drosophila has a minute genome makes it impossible to argue that larger amounts of DNA are essential to carry out sequence-specific roles. In an organism with 100 times as much DNA as Drosophila, such as a salamander or a bean plant, most of the DNA could be unessential for coding or regulatory functions" (Gall, 1981). Although there were 'pre-modern' arguments for a chromatin-structuring function of non-coding DNA to enable transcription, the majority of biologists adopted the term 'junk DNA' as appropriate excuse to not care much about deciphering its role (see here for a summary). In their work Attanasio et al. do not explicitly enter the 'junk DNA' debate. They show conclusively, however, that experiments are the way—sotto voce: as always in science. The somewhat bumptious announcement by the ENCODE project to have solved (most) of the 'junk DNA issue' by presenting algorithm-derived predictions of function(s) for the major fraction of non-coding DNA deserves exactly the kind of experiments described by Attanasio et al.. Also, it's experiments that will put an (due) end to the decade-long intellectual sophistries on whether 'junk DNA' should be better called excess DNA, surplus, nonessential, or degenerate or silent DNA, garbage DNA, non-informational or nonsense DNA, worthless DNA, trivial DNA, vestigial DNA, redundant DNA, supplementary DNA, secondary DNA, or incidental DNA (see here for citations). After a talk, Nikolaus Rajewski answered in an anecdotal way a question from the audience how RNA interference (RNAi; see video here) was actually discovered: "Once upon a time when people got used to purify RNA by gradient centrifugation. They were excited to get reproducibly two distinct bands next to some smear in the upper part of the tube and lots of in the lower. The two fine bands turned out to be the large ribosomal RNAs and the smear in the upper part mRNA. The smear in the lower part of the tubes contained tRNAs, 5.8S RNA and huge amounts of degraded RNA—apparently junk—that they eagerly dumped into the sink. Some 20 years later, people stirred up that junk and found … a zoo of miRNAs and siRNAs". It apparently can be rewarding to dig in the junk for jewels. You may eventually find out why a mouse looks the way it does. Christoph Weigel is lecturer at the Life Science Engineering faculty of HTW, Berlin’s University for Applied Sciences.